We are so happy that you decided to spend your bachelorette party weekend in Savannah, Georgia! Great choice ladies! Savannah is a southern gem of a town. You are going to have such a fabulous time here in Savannah. We have listed out our favorite things to do for your Savannah bachelorette party weekend. Our Savannah Bachelorette Party Guide is below. Jam packed with the best ideas for what to do on your weekend in Savannah. Whether you are planning a bachelorette party in Savannah or a girls trip or ladies weekend in Savannah, you will find some great tips below! We hope you will also consider doing a flower crown workshop with us or ordering flower crowns for delivery for your weekend in Savannah. Either way, we wish you the best stay in our southern charm of a city! Savannah has amazing weather, great food, fun options for activities, and well DRINKS upon DRINKS. If you are looking for a city to spend your bachelorette party in where you can drink outside from location to location then Savannah might be the spot for you. You can actually drink outside from bar to bar. People are walking around everywhere with drinks. Don't worry you will not get arrested for drinking outside of a bar or restaurant in this city. If you are contemplating a Savannah bachelorette party or maybe a Savannah girls weekend this could be a lovely place to spend your celebration. 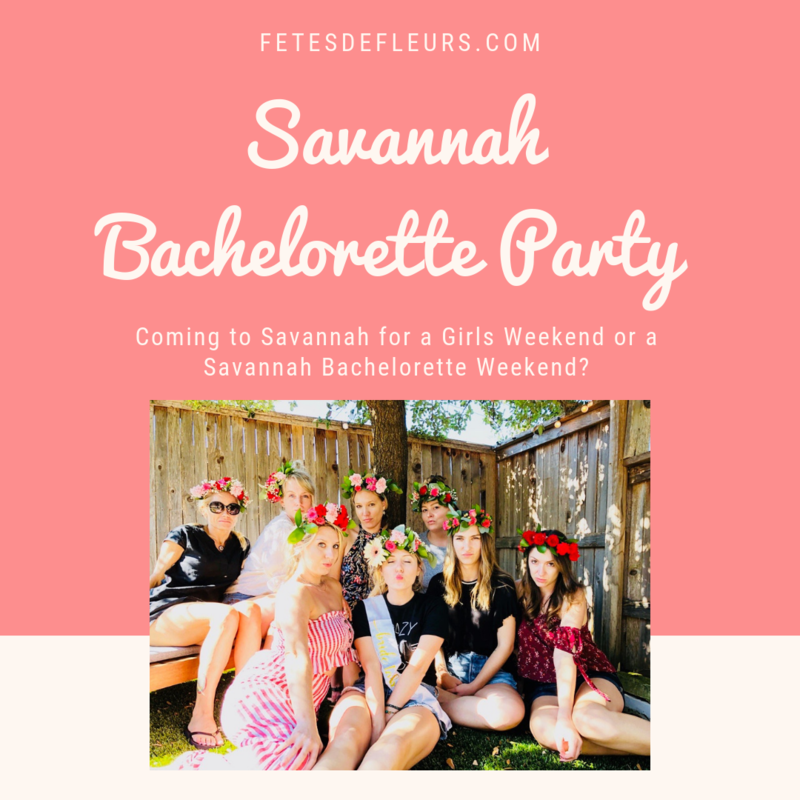 Heading to the Savannah area for your bachelorette party? Maybe you are coming to Savannah for a girls weekend or ladies weekend? 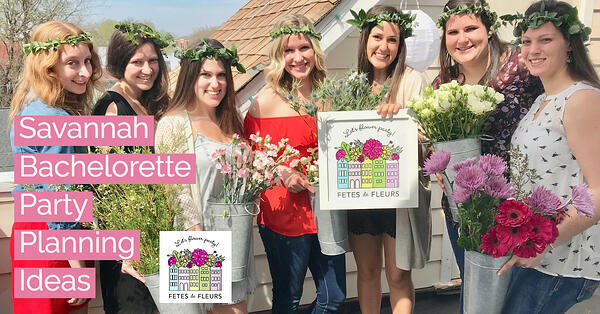 Bridal showers, baby showers, birthday parties and other celebrations are great fits for hosting a flower crown party with Fetes de Fleurs. Fill out the form to the right to learn more about how our flower crown workshops and flower crown parties work. We would love to help you celebrate with flower crowns! 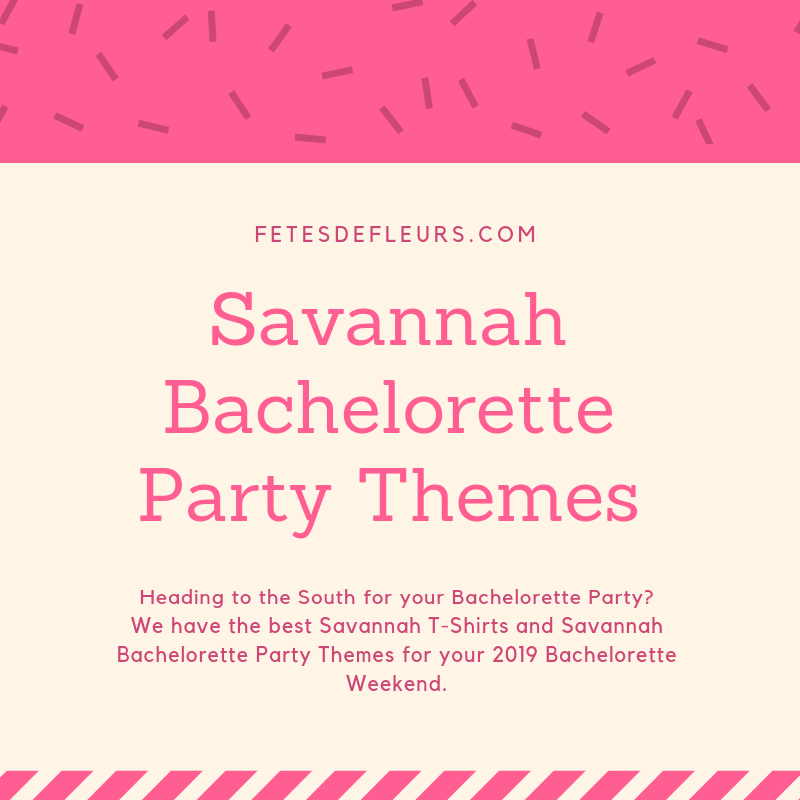 Request more information about hosting a Savannah bachelorette party with Fetes de Fleurs Flower Crown Parties here. Savannah is one of the fastest growing wedding destinations in the US which makes it perfect for your all your Bach party plans and activities. There are so many amazing things to do in our cute city that it can be slightly overwhelming planning it all out. NOT TO WORRY THOUGH flower babes, that is why we exist! So, whether you’re the “plan it when we get there” kind of bride tribe or the “Itinerary for everyone” kind who likes plan it all ahead of time, we’ve helped you narrow down the top 5 must-do’s for your bachelorette weekend in Savannah or your ladies weekend in Savannah. In a previous professional life, I travelled A LOT. Living out of a suitcase, the concierge knowing my name, I am a hotel expert at this point. Which is pretty cool when I live so close to so many popular travel destinations. My favorite is Savannah, GA. I adore the crumbling staircases, the Spanish moss draped all over the trees, and the buildings with the plaques proudly boasting the year they were built. It’s soaked in history. It’s also soaked in good times and music and food which makes it perfect for a bachelorette party weekend. 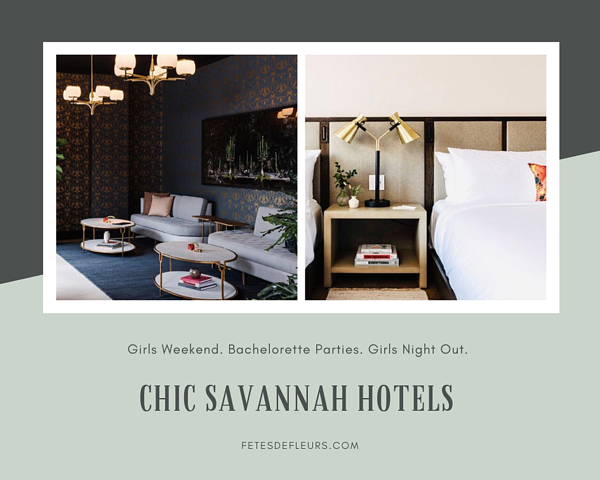 We cant't wait to give you the down low on the chicest hotels for your bachelorette party weekend in Savannah. Are you heading to Savannah for your bachelorette party weekend in 2019? WELL CONGRATS GIRLIES BECAUSE YOU HAVE PICKED A WINNER OF A CITY FOR YOUR BACHELORETTE PARTY WEEKEND. WE LOVE SAVANNAH for bachelorette party weekends. 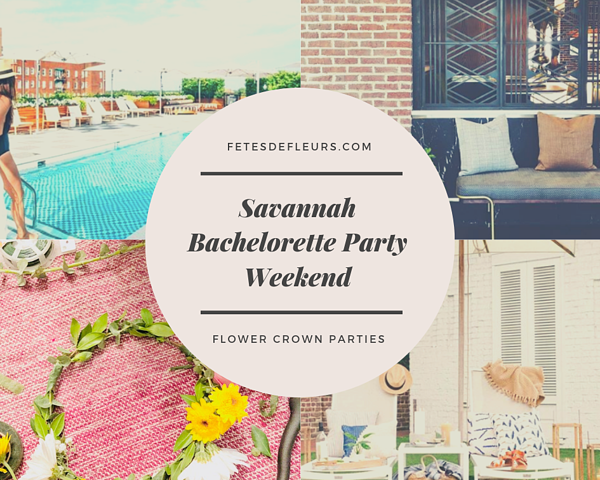 It is legit one of the cutest southern cities in the US and we can't wait to help bachelorette parties coming to Savannah this year to party in FLORAL STYLE with our flower crown packages. Hey there! This is Alex, I am one of the 2 flower party hosts in the Savannah area. I love making memories and acting like a tourist in my home cities. I think it helps keep the city fresh for me and honestly, I personally would rather make memories than get new clothes or shoes with my fun money. So, Savannah is a great city to take tours and sight see thanks to the history, architecture, and art & design college. We wanted to do a roundup of the tours that we love in Savannah so as you plan your Savannah bachelorette weekend or Savannah girls weekend trip you know which ones to book! I love beer. Beer is my favorite grown up beverage. I have specific beer that I drink when I’m feeling nostalgic and certain beer for Sunday game day. I also love how the flavor profiles of beer have expanded so much thanks to technology and brave craft brewers. Savannah seems like a sleepy southern town that wouldn’t cater to beer lovers, but ha! We tricked you, Savannah has great breweries and if you and your girlfriends are looking for a brewery tap tour, Savannah is the place for you. 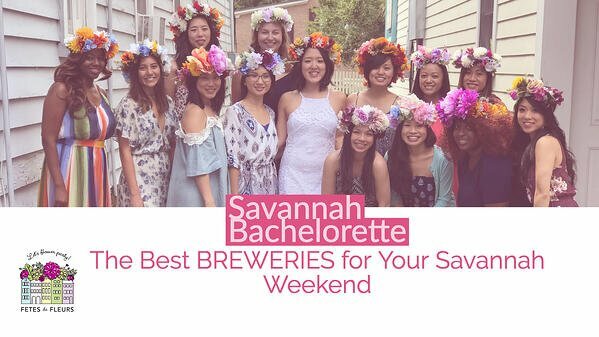 It seems there are plenty of bachelorette groups who love beer too so we definitely want you to know what Savannah breweries you should experience while on your Savannah bachelorette weekend or Savannah ladies weekend. You have decided that you want to go to the cutest town ever: SAVANNAH for your bachelorette party weekend. GOOD! We love and really <3 Savannah. It is such a cute and charming southern city so we can't wait for you to visit us here. We have a round up of our favorite things to do on your Savannah bachelorette party weekend on our Savannah bachelorette party guide here so take a look as you plan your trip. 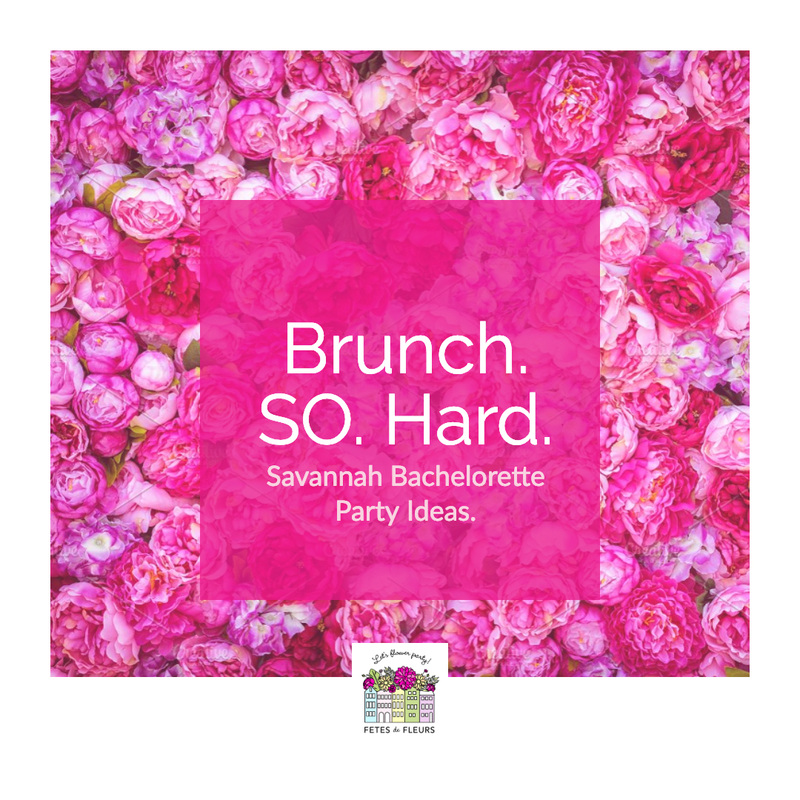 Savannah is one of our newest locations that we are hosting our flower parties in for celebrations like bachelorette parties, bridal showers, baby showers, birthdays, and all kinds of fun nights for local ladies in the Savannah area. 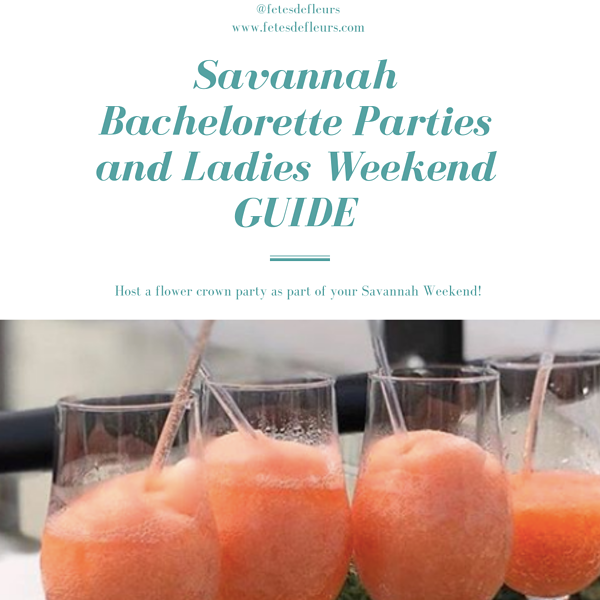 We had our 1st flower party in the Savannah area this past weekend so naturally we wanted to recap the party to give you an idea of what goes into our flower parties in case you are researching Savannah GA bachelorette party weekend ideas. We highly recommend Savannah for a bachelorette party weekend because well, there are SO many fun things to do and of course we want to flower party with you while you are here in our charming city.